Winter in the Wallowas-gouache-5" x7"
I painted today. Nothing special really, just had an urge to paint something wintry. It is December after all and one of my favorite months! Though it's been quite cold in my neck of the woods we don't have any snow and to me it's just not December without snow. So I decided to paint myself some. The scene I chose to paint is in Wallowa, Oregon. I visited there a few years ago in winter and it was magical. On this very cold, sunny morning the snow sparkled like a bazillion diamonds wherever the light hit in. The shadows were lovely shades of frosty blue and lavender. And the mountains.....ah, they were breathtaking! Wish I could visit right now, but I guess I'll just have to settle for memories and my little painting. 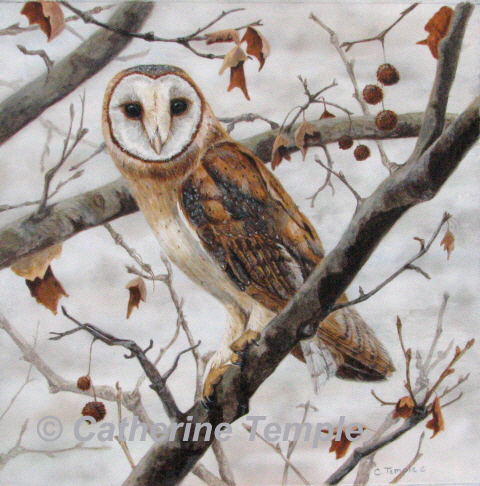 Subtle Elegance-Barn Owl- Acrylic-15" x 15"
It's been awhile, but lots of things have been happening and there just doesn't seem to be enough hours in the day to get everything done so I have been a bit negligent in my posts here. I apologize and will try to do better in the coming weeks. The latest and most exciting news is that my painting "Subtle Elegance" has been included in a show called "Owls-Guardians of the Night" at True North Gallery in Hamilton, MA. I was contacted by them just a few weeks ago after they saw this piece on my Daily Paintworks site and thought it would be a good addition to their show. What a thrill for me! Though I have had pieces juried into other shows this was the first time a gallery approached me directly. The show opens this coming Saturday, Oct. 17th and runs through Nov. 8th, 2015. If anyone is in that area please stop by and see the show. It promises to have some awesome artwork and talented artists! 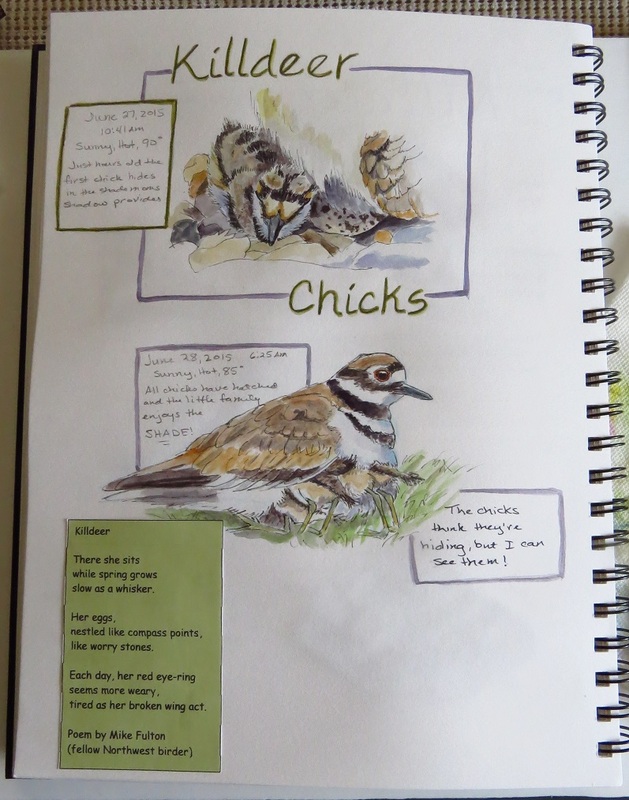 Now that summer is in full swing I've been busy with my usual gardening, but I still find time to keep track of some of the nesting birds in my area. 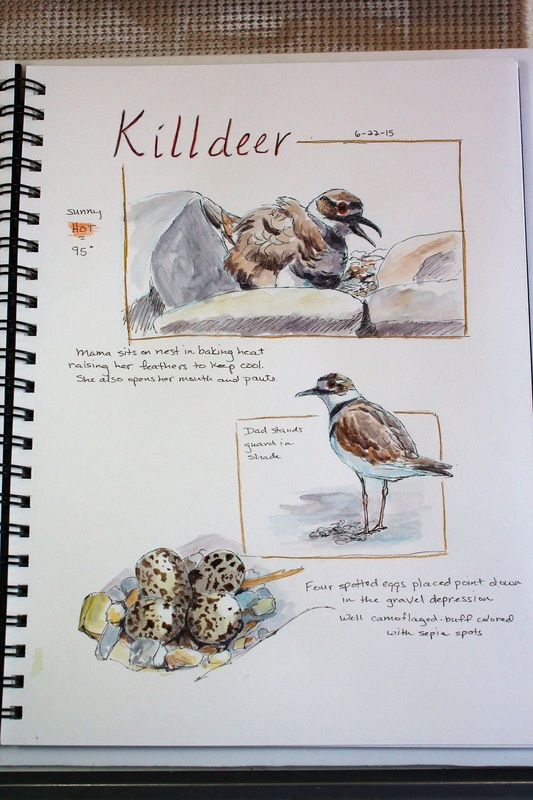 As you may recall at the end of June I was monitoring a killdeer nest in a hot parking lot. My concerns for her grew as the temperatures in our valley continued to climb every day to between 100 to 107 degrees. A parking lot full of rocks had to be much hotter. I checked every morning to see if she survived the heat from the day before wondering if she would abandon the nest or tough it out. She stuck it out. On June 27th I was lucky enough to observe the first of her chicks to hatch. At 10:40 a.m. it was already 90 degrees in the parking lot, but tucked under the shade Mama was providing was a single chick. It was a few hours old and all downy and dry. 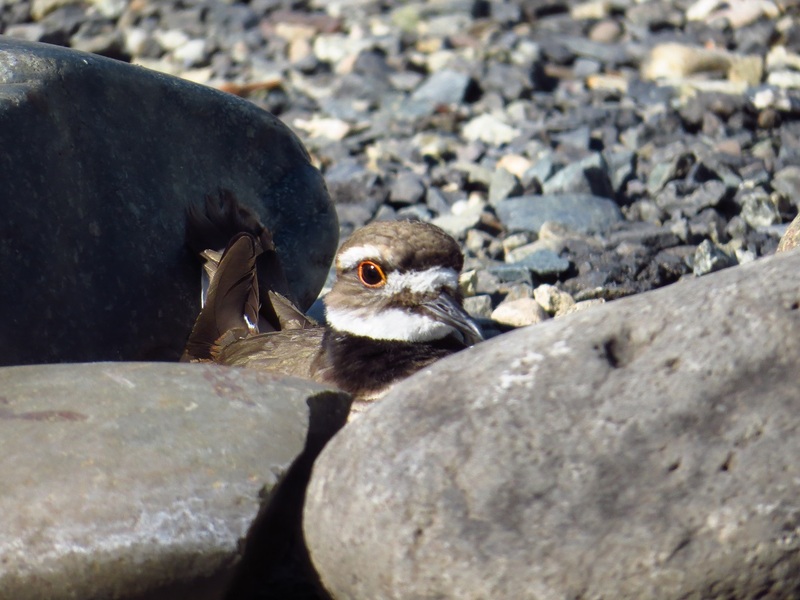 Killdeer chicks are ready to go as soon as their feathers dry so when the rest of the brood hatched I was hopeful they'd all head for the shade. The next morning I found the little family across the street in a shady yard. The chicks were scampering about when I arrived, but quickly headed for Mama and tried to hide under her. Their tiny heads were all that fit, but in their minds they were hidden. Feet and tails stuck out everywhere making a comical sight. I'll tell you what. There's not much cuter than a newborn killdeer chick! Hope you all are enjoying your summer! Between gardening and bird watching I know I am enjoying mine! Summer is here in the Northwest, there's no doubt about it! In my corner of Washington the temperature is supposed to climb to 100 degrees by the end of the week! As much as I love being outdoors, when it gets that hot I only go out early in the morning or late in the evening. The rest of the time I stay inside and find other things to amuse myself. Normally, that includes processing a lot of fruits and vegetables from my garden, but some days I just need a creative break so today I sat down and did a page in my sketchbook journal. 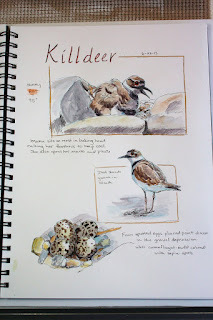 I have been watching a pair of killdeer that are nesting in a church parking lot near my home. On days like today I feel so bad for them because they nest on the ground or many times on flat roofs with gravel and the temperature must be unbearable for them. But there they sit, with feathers raised and panting to let heat escape all the while shading the eggs so they don't overheat. That's one dedicated parent! There's not much that gets them to move unless you approach too closely. Then they give a sharp alarm cry and go in to their broken wing routine to lure you away from their well camouflaged nest. Killdeer lay their eggs in a scrape in the gravel and they are cryptically marked to blend in with the surroundings so they are very hard to see. A bird loving church-goer placed large stones around this nest to mark it's location so that it would not accidentally get run over. If all goes well it shouldn't be too long before the unbelievably cute chicks hatch and the whole family can run off to a cooler location. I will continue to monitor their progress when I go out for my early morning walks. 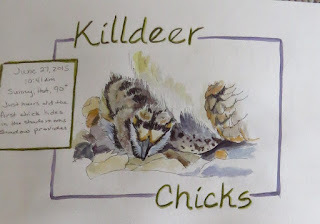 Hopefully, I will get to see the whole family foraging together for bugs and make sketches of those cute chicks when I'm not up to my eyeballs in produce! The hummers are here! A few have been arriving the last few days at my feeders. I usually get up to four different species, Black-chinned, Rufous, Calliope and occasionally Anna's. So far I have painted the two I see most throughout the summer and have them listed through my auctions on Daily Paintworks. 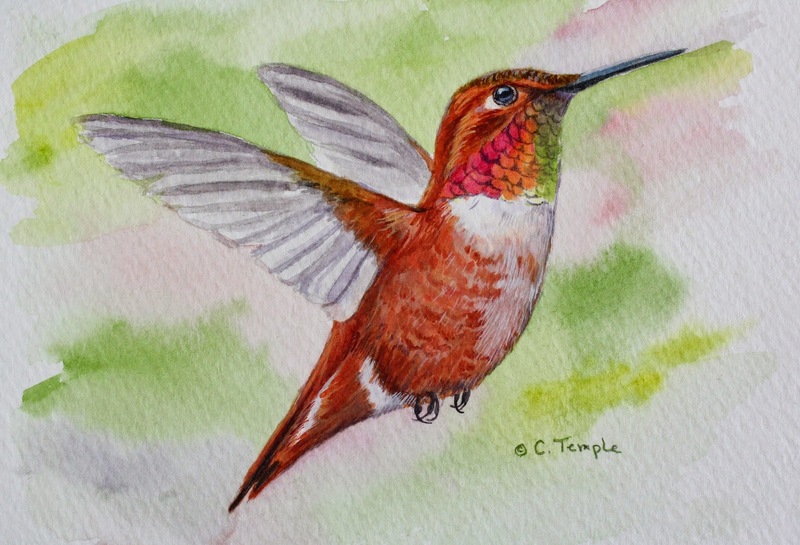 Rufous Hummingbird-watercolor and gouache-5" x 7"
I am getting anxious for more hummingbirds to start arriving and for my garden to start filling in so they have a place to play. In years past it has been a joy watching them bathe in a broccoli leaf, zip in and out of the sprinkler, hide in the morning glory vines and fight over the food sources. They are endlessly entertaining and I can spend hours trying to photograph them so I have good reference to paint. Well, I'd better get back to painting! I still have two more species to go and more hummers to look for! Hummingbirds are some of my favorite birds and it turns out the rest of the country is in love with them, too. Some folks spend hundreds of dollars a year to keep their feeders full of sugar water to attract these flying jewels. While I don't go that crazy (only because I don't get that many hummers) I do spend a fair amount of time trying to attract them by putting up feeders, planting their favorite flowers, etc. I have even gone so far as to leave a feeder out into December last year wrapped in a mitten and red lights for the late migrating Anna's that were moving through the valley. I was rewarded with photos, too, for my efforts. 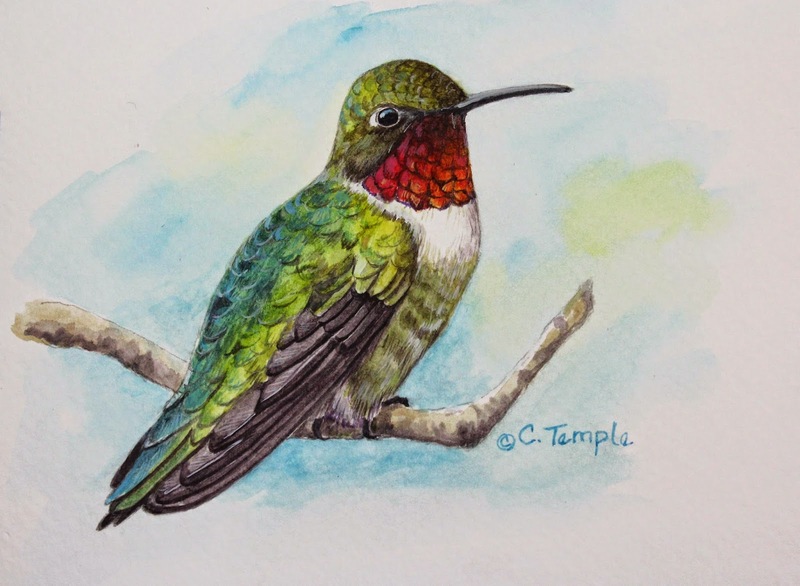 In anticipation of the hummers arriving my feeders are up and ready and I painted the ruby-throat to kick off the season. While I don't get them in my part of the country they are among the most popular of the hummers so I started with them first. I grew up with them in Illinois and saw lots of them while visiting my dad in Kentucky so I am well acquainted with them. The above painting is currently available through an auction at my Daily Paintworks site. Zip on over and have a look, then get your feeders out. The hummers are coming! 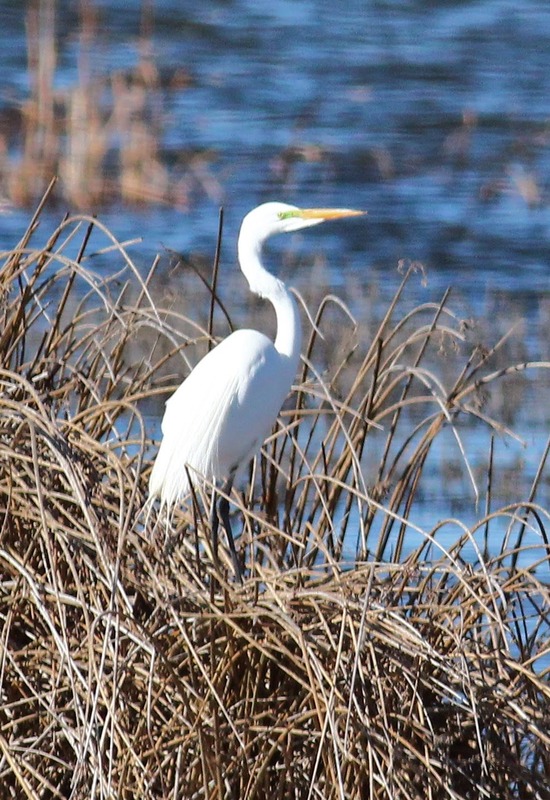 As spring advances across the country so do the migrating birds. Some have been here for awhile and are already nesting. Many others are arriving daily and will stay in my area to nest while still others will visit and continue on farther north. I love this time of year because, along with the regulars like this tree swallow, surprises show up. Every morning on my walk I check specific areas that I know attract migrating birds to see who arrived over night. Nothing out of the ordinary has been seen yet, but there's still plenty of time. In the meantime, I am contented to see the familiar faces and delight in the gorgeous colors of their breeding plumage. 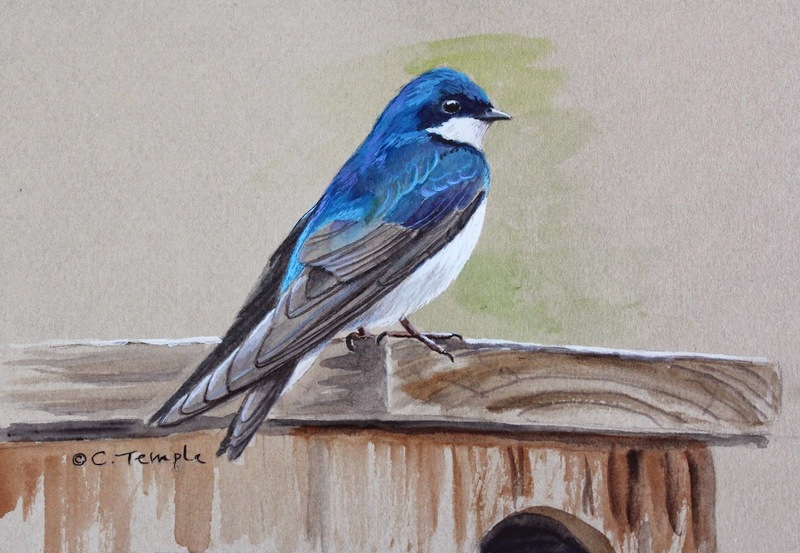 I love the beautiful blue iridescence of tree swallows and capturing that depth and sparkle in paint is a real challenge. This male sits atop his chosen nest box for the season. He is painted in watercolor and gouache and is available for purchase through my auctions on Daily Paintworks. Over the weekend my husband took me to the Columbia National Wildlife Refuge in Othello, Wa. to look for Sandhill cranes. 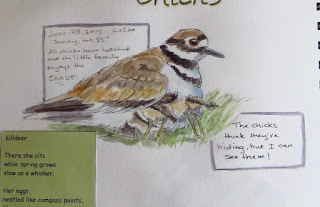 Every year at this time they migrate through central Washington and stop in this unique refuge to rest and eat as they continue on to their nesting grounds further north. The refuge is a staging area for many birds during migration and is an important nesting area for waterfowl. The refuge is a shrub-steppe desert with wetland potholes. 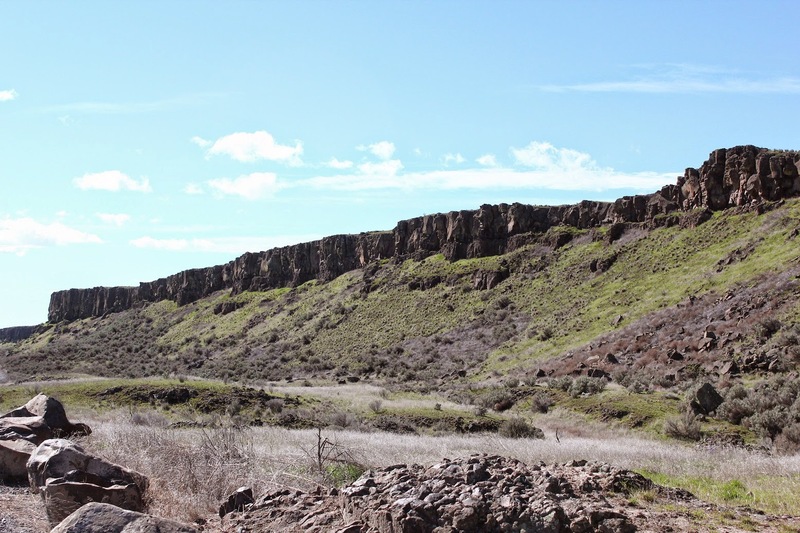 It was carved out during the Ice Age as massive glaciers scoured the land as they moved leaving basalt cliffs, gouging out coulees, creating gravel bars, depressions and nooks for water to pool in. Add to that man-made irrigation and reservoirs and this unique habitat was born. After traveling through the refuge we finally located a small flock of cranes resting in Marsh Unit One. They usually head out to feed in the surrounding farm fields in the morning and evening and rest in the refuge during mid-day, but the wind was howling at 25 - 30 m.p.h. 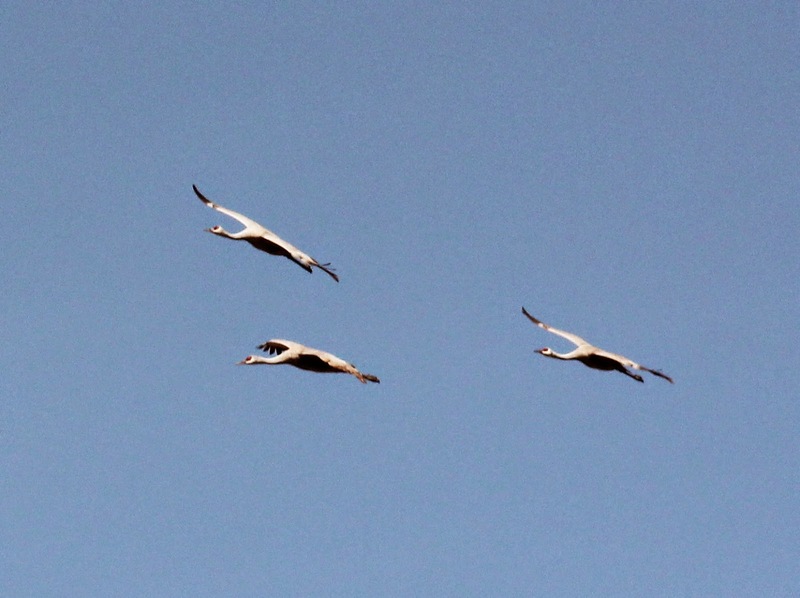 making it difficult for the cranes to fly so they were holding in secluded areas out of the wind. We were never able to see them very close and not without the aid of spotting scopes or binoculars, but seeing them at all was a great treat. Before we left three large flocks battled the wind to land with the others in Marsh Unit One. As they circled above us we could hear their unique call all around carried on the stiff wind. I was able to get some photos, but even with my super telephoto lens it was a challenge as they were a good distance off and the wind made it difficult for me to stay steady. Still, I left there grinning from ear to ear and even my non-birder husband had enjoyed the show. Labels: Columbia National Wildlife Refuge, great egret, Othello, sagebrush, Sandhill crane, shrub-steppe desert, Wa. 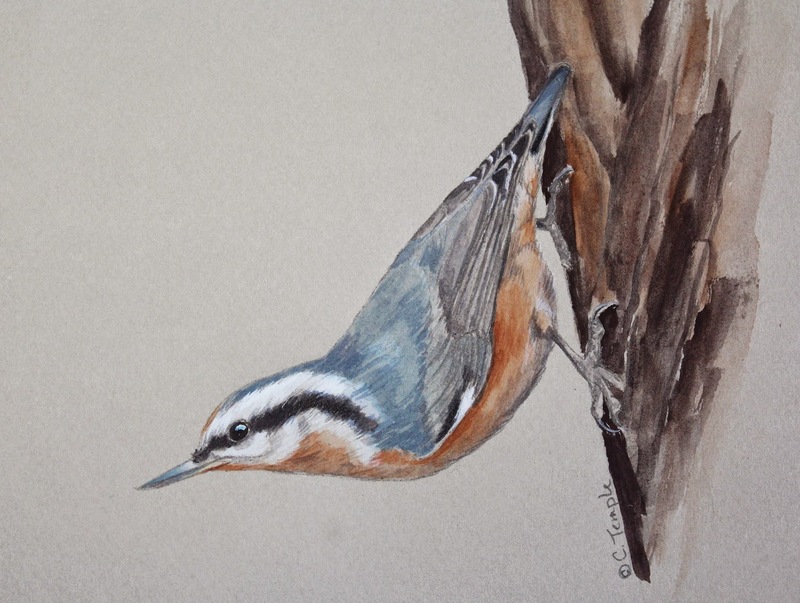 Red-breasted nuthatch-watercolor and gouache on Mi-teintes paper 6" x 8"
It truly is an upside down world if you are a nuthatch! These acrobatic little birds spend their days foraging up, down and around tree trunks and branches. I have rarely seen one in an upright position though they can perch that way. They seem to prefer the position in my painting, clinging from the side of a tree. The noise they make is comical as well. It has been described as a tiny tin horn, though I think it sounds more like a nasally "yank, yank". This little sketch is for purchase through an auction at my Daily Paintworks online gallery. Click below to bid. 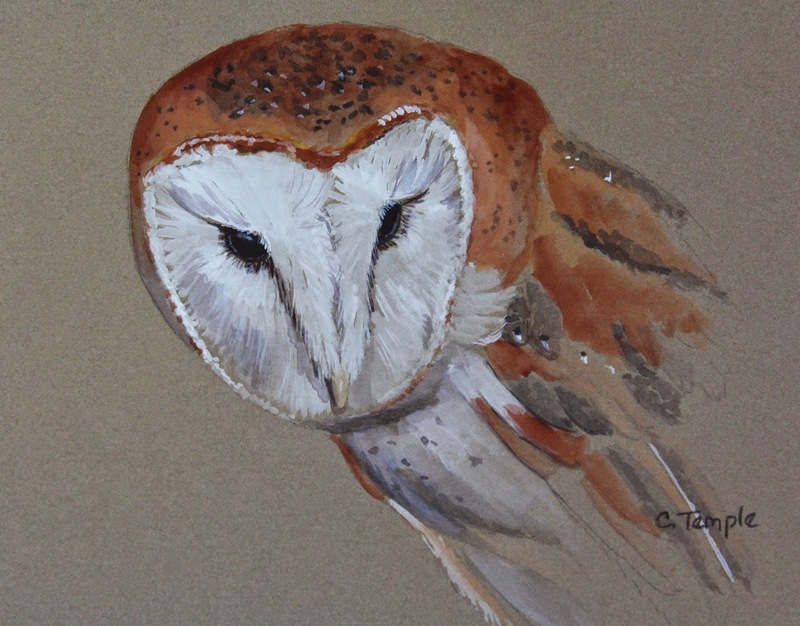 Barn Owl-watercolor and gouache on mi-teintes paper 6" x 8"
Here is another owl in my series of quick studies on toned paper. This one is a barn owl. He was a captive bird that was being kept by the Washington State University Raptor Club because he had been injured and could not be returned to the wild. WSU has a fantastic veterinary teaching hospital on the campus and injured wildlife of all kinds ends up there to be cared for. The Raptor Club uses some of these injured birds at schools or community events to educate others about them. It is always a great opportunity to see these birds up close as many are nocturnal or not very approachable in the wild. Barn owls are another owl species with dark eyes. Their face is heart shaped and as their name implies they roost or nest in barns, buildings and dark cavities. This sketch is for sale through my Daily Paintworks online gallery via an auction. Click here to place a bid. 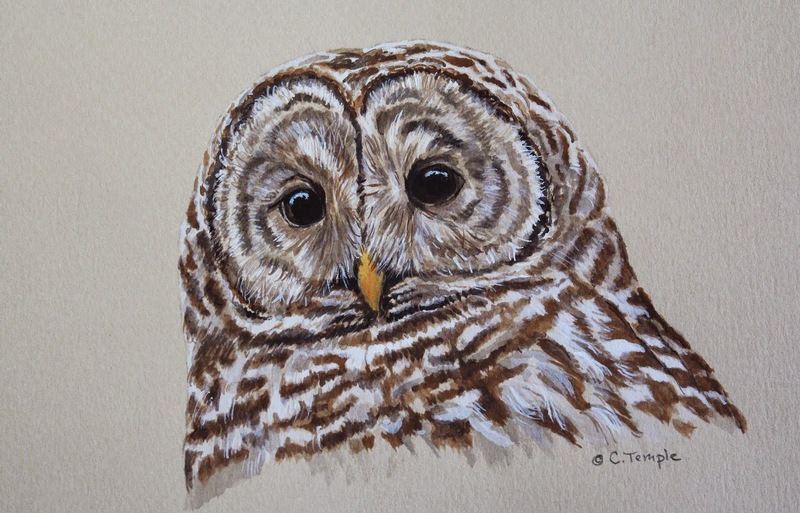 Barred Owl - watercolor and gouache on toned paper 6" x 8"
I got to view this owl this winter when a friend called to say he had located one roosting in a bare tree along the river. The bird was very approachable and unconcerned by the three bird watchers below it snapping photos. At one point it blinked slowly, closed it's eyes and yawned! I took several reference photos, thanked the bird kindly for being so cooperative and then let it have it's nap for the day. Barred owls are one of the few owl species with dark eyes. They are similar in looks to the endangered spotted owl and their range and habitat overlaps as the barred owls territory expands. 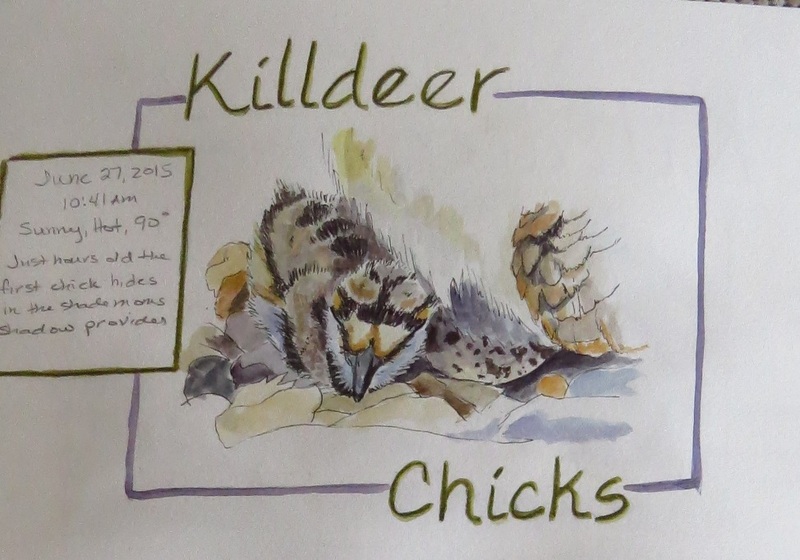 It has been discovered that the two species hybridize and the spotted owl may be declining due in part to this and being killed by the barred owl. 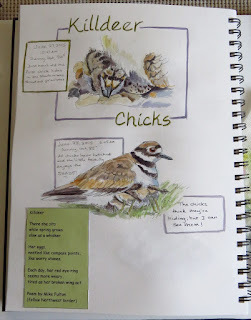 I currently have four bird sketches up for auction, with another one starting in a few days. Keep watching here or visit my Daily Paintworks gallery. The days are getting longer and the weather is getting warmer....at least in my part of the country! We've just turned the calendar to March, can spring be far behind? While I try to have patience for better weather so I can join my husband in his little trailer without being locked inside with the windows covered to stay warm, I have been amusing myself with doing quick bird studies on toned paper. I have done this technique before (see this post) and liked the results so I decided to try a few more. I found this little sparrow scratching in the leaf litter under some blackberry brambles. At my approach he promptly disappeared into the tangle of vines, but after I made some "pishing" noises he popped out and posed long enough to snap a few reference photos. I decided that painting him on green toned paper made me think of spring and new adventures! In spite of the big winter storm back in the Midwest and the East coast, the forecasting groundhog made an appearance long enough to see his shadow. Six more weeks of winter! While we are missing out on the great snow storms here in the Northwest, the low clouds, rain and fog are making it quite dreary. On days like that it's nicer to stay inside with a favorite hot beverage, do some sketching and dream of nicer weather. I have actually been doing a lot of dreaming these past few months as circumstances in my life are shifting. At certain crossroads it's good to step back and assess where you're going and if your priorities have changed. It would seem that I have arrived at that crossroads and it's time to make some decisions. Oh, don't worry, it's nothing terrible. I'm not giving up art or anything like that, but it might be going in a different direction. Last fall my husband finally went back to work after a long lay-off, but it required him to be away from home for extended periods. It has been a big adjustment for us and while we're not happy about being apart we are grateful for the work. What we didn't realize at first was that it actually was presenting us with a new opportunity. For this new job we bought a small travel trailer for him to stay in. This now gives us the option for me to go and join him wherever he may be working. So now I get to try creating art "on the road". I am excited to be able to explore new places and hope to be able to actually spend more time on my art, documenting the new things I'm seeing. But this traveling lifestyle will take a bit of planning as I will have to make adjustments for painting in a smaller space without access to all of my art supplies and reference material. And it also means that I have to consider how things will be taken care of at home while we're gone, so the normally large garden I plant will have to be down-sized considerably. (I'm not sure how I will do that!) Still, I'm looking forward to the challenge and the new possibilities. It will still be a month or so before I can start joining him (six weeks if the ground hog is correct!). Until then I will be setting myself some new goals, collecting some "traveling" art supplies and making my plans.